This is the first year in many moons that we have grown any veg. We have the space, whereas before our move our smallish terraced house back garden, although quite capable of growing some veg, was mostly used as a flower garden, and though I say it myself, very nice it was too. So this year we have plenty of space and much growing on. I have a liking for purple sprouting broccoli. I hadn’t had any since leaving the family home back in the mid 70s. My mum used to grow purple sprouting and even back then it was gradually being ousted in the public mind by the big green calabrese broccoli. So it was with quite surprise that last year the local shop on Chelsea Road, Easton, began selling spears of (fairly) fresh purple sprouting broccoli. I was in broccoli heaven. 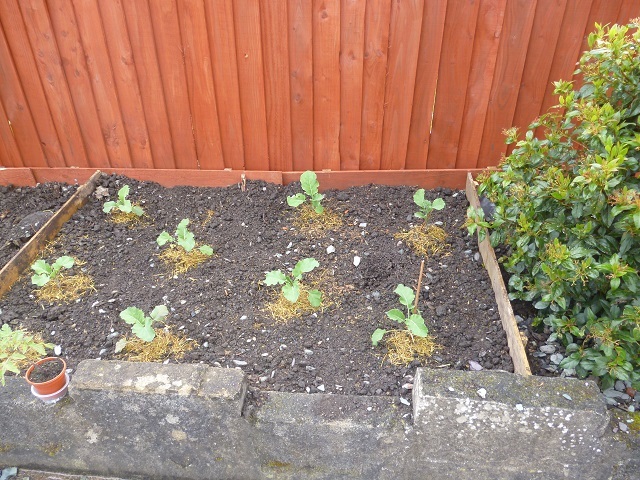 So purple sprouting broccoli is in the ground and growing on. It’s an early variety so hopefully by november we should have a crop. The veg in raised beds are beginning to show good signs of growth. 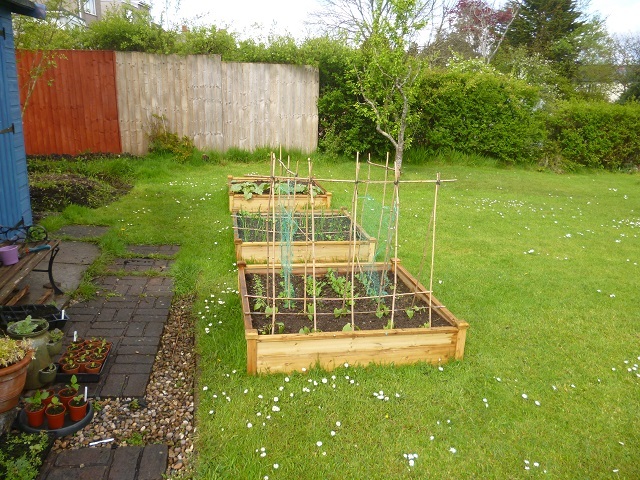 We bought these beds as a temporary measure, so that we could start the veg garden off. Although there is plenty of space here, we don’t know what we have growing in the garden. It seems to be mostly shrubs and perennials, and several apple and pear trees. But until we let it grow out, we won’t know just what is growing here. So, we are waiting a year before making too many radical changes. There is a sectioned off area which appeared to be just a garden waste tip, several tonne bags with rotten apples, pruning and grass clippings that were slowly rotting down, and a general overgrown tip area. But as we were clearing it, we found early signs of rhubarb growing (this was back in february), it was almost trodden under foot. So we’re yet to see what else might be planted and as yet hasn’t shown itself. Ah… hmm… that’s the problem with drafts, I forget about them… So 2 weeks later and the garden has come on even further. Last weekend was a bit of a hurdle though, strong winds, and quite chilly, so a few plants look less comfortable than they did. The salad leaf patch is, however, growing very well, but I can’t say the same about the dwarf french beans… dwarf seems to be the operative word. The courgettes look a bit wind burnt too, I think on reflection we put them out just a little too soon, though saying that, there are signs of several baby courgettes on the way, quite a few flowers so more to come. Topsoil, Raised Beds, Planting Out. This was a few weeks ago. Since then it has been transferred to 3 four by four raised beds, approx 10 inches deep. 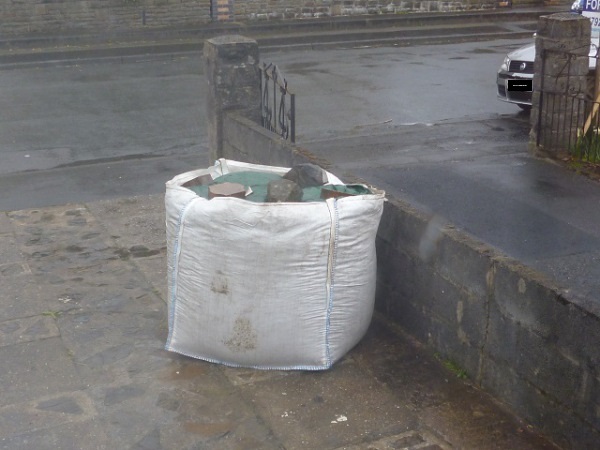 Took quite a while transferring in small bags via wheel barrows and a cobbled together shute. but we got there. The soil here is very heavy, some seams of pure clay, so it needs to be worked down. Have plans to dig in two rudimentary compost heaps that live at the bottom of the garden, mostly it seems quite well rotted. We’ve started our own compost bin, and have been feeding it with peelings and veg scraps from the house, and grass clippings, which we have lots of. Layering grass mixed with shredded paper, cardboard, and twigs, with layers of twigs and well rotted dried leaves, and a sprinkle of compost activator. Seems to be going well, getting quite hot. So far we have tomatoes, potatoes, courgettes, french beans, runner beans, carrots, spinach, purple sprouting broccoli, peas, mixed salad leaves, cress, onions, and garlic, either planted or being brought on ready for planting.